A member of the Destiny 2 community has released something extremely useful for Guardians who want to track everything they need to do on both a daily and weekly basis: TodayInDestiny.com. The site is up right now and available for you to use without needing to login or anything! While it tracks most events there are definitely more to come, so don’t jump on there and complain just because something you want isn’t available yet. The site breaks down events going on in Destiny 2 at the moment by their expansion, and gives some a required Power Level should one exist. Each event has a card with all of the information that you need on it; the expansion it relates to, what type of activity it is, a little information about it (lore for example), and the potential and guaranteed rewards for completing the event. At the moment you’ve got to balance base game Destiny 2 events, Curse of Osiris events, Warmind events, Forsaken events, and even Black Armoury events. With so much going on in the game it’s actually refreshing to see such as simple design that incorporates a hell of a lot of information that you usually have to retain in your head. The thing I tend to do is get all of my bounties at the start of the week, and every day for the daily ones, and then play for as long as it takes to complete them. The issue I have at this point however, is being able to keep track of everything I’m trying to complete, which usually leaves me checking the menu every time I think about bounties. The new site alleviates a bit of that hassle right now, but there’s every chance it’ll be expanded to track bounties in the future if enough of you request the feature. 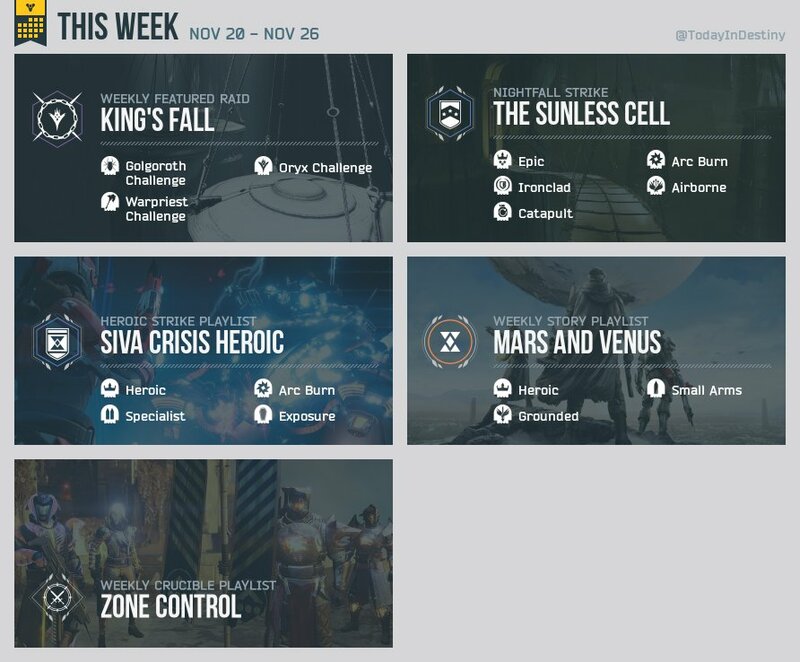 What it changes for me is the need to check what the Daily Heroic events and Weekly events are. One final point that I love about TodayInDestiny.com is that it shows you the required Power Level for certain events. One bit of contention is the fact that Black Armoury content requires a very high Power Level right now. Bungie have since said they’re lowering it, but simply being able to glance at this site and check where I’m going to be able to achieve something and where I’m going to get wrecked really does help. Believe it or not I do often jump into events and activities without realising that I’m way too low in Power Level to do. Let us know what you think of the site in the comments, and please do head over to use it and support the person/people behind it.